I woke early Saturday, since I needed to put my checked luggage outside the door of my cabin before breakfast. 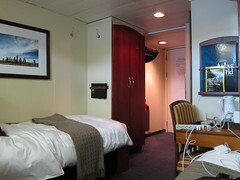 And since the crew had two hours between our vacating our cabins and the next week's passengers arriving to change the sheets. I decided to give them a bit more time. The ship has a two week agenda. 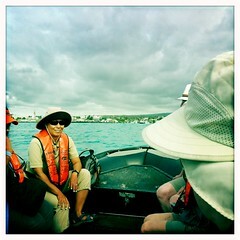 We saw the south and east islands; the next week's group would see the young, western islands. Lava. 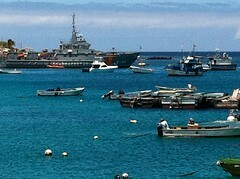 Isabela and Fernandina. 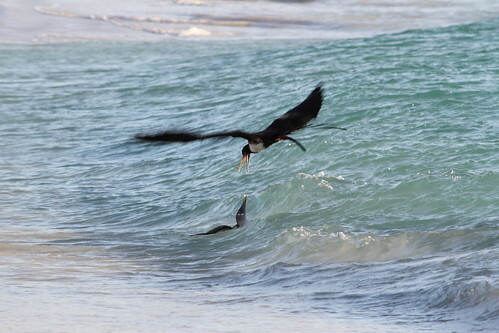 Flightless cormorants. Between this and the dry/wet season split, I feel like I've seen about a quarter of what there is to see, and I didn't see everything this time around, either. They played Lindblad Expedition videos as we waited to leave after breakfast... and I want to go on them all. The Antarctic, yes. Seeing the polar bear pressing its face against the ship's porthole to look inside (and hearing Birgit talk about that, the other night) definitely whetted my appetite for the Arctic, before it's gone. The Amazon seemed fun. 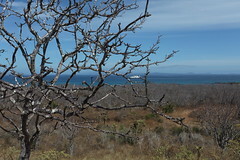 Baja is close but similarly matches desert and ocean. 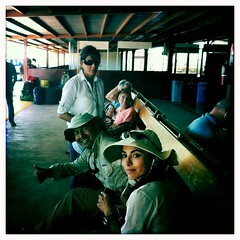 We didn't get to the Costa Rica portion; it was time to depart. 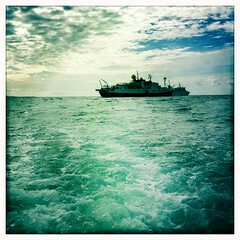 Our last zodiac ride was a bit sad. I gave Gaby a hug at the dock; all the naturalists were great but I had been with her for some of the most memorable walks. I spotted the last two Giftmas items I needed for the nieces -- bought 'em and then headed into the airport, where there was free wifi. Ahhhh. 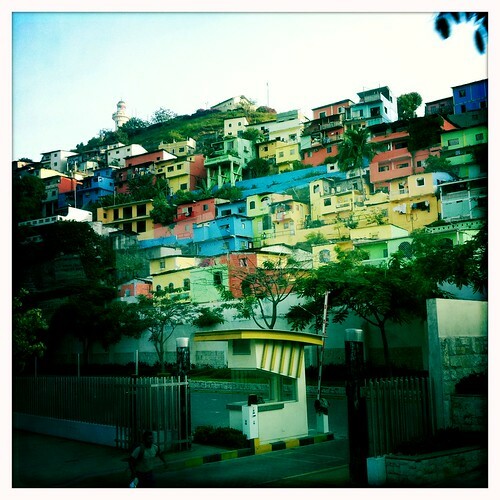 Back at Guayaquil, where we were all a bit frazzled. I wanted to go on the city tour despite only having an hour between arriving at the hotel and leaving -- essentially only a half hour in the hotel room to wash up and go out again. 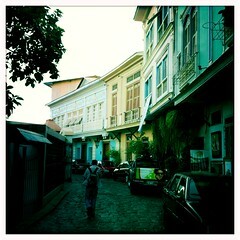 I did enjoy it though, the boardwalk and the colorful old town. Tempered by the sight of malnourished kids trying to sell candy and the knowledge that hailing a taxi on the street was asking to get robbed. It was nice traveling with only my point and shoot and iPhone camera, after lugging two DSLRs around all week. Got back, worked out, showered. Headed down to the bar, where many of us were gathered before dinner; it was like the ship, except no soothing announcement from Cindy. 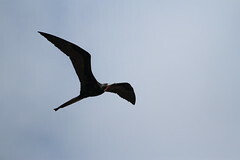 I ate with the nineteen -- those who had gone on the Machu Picchu extension trip before the Galapagos cruise. Now I'm wondering why I hadn't gone, as well; it sounded fun and the group was very tight. I think I was worried about needing more clothes and more camera gear, which was valid. I think limiting myself on this first solo trip might have been good as well. The prawns were frickin HUGE and seriously tasty. 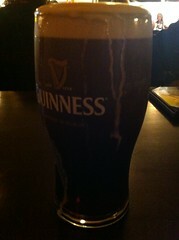 Afterwards I joined Kristie and Maureen back at the bar and got tipsy on pricy booze and stayed up past my bedtime. It was fun though. The smooth travels so far? GYE -> JFK not so much. all added up to a relieved Aki once I was at my hotel shortly after 11pm. 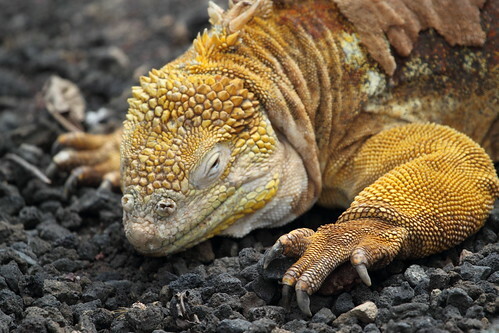 Staying in Manhattan for a day seems odd, especially after a trip to the Galápagos. I think it was a good end to my vacation, though. A full day to myself, guided only by my iPhone, Yelp, and vague "hm, I want to [eat|see|do] ____". just a general feel for the city that you can only get by walking through it. Bus tours have a different feel. 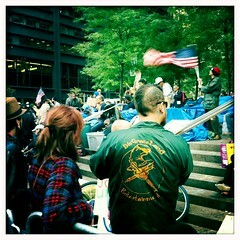 Google maps tells me a direct route from my hotel to Zuccotti Park was ~4miles. I'm guessing I walked 9-10 miles that day. I definitely want to spend more time there at some point. The flight home was uneventful. I'm still not all unpacked, nearly a week later. my cotton carrier; this allowed me to lug around my 100-400mm with ease. both my dslrs, though I wish I had brought my 24-105mm instead of my 17-40mm, given how often I was photographing at the 40mm end of that lens. 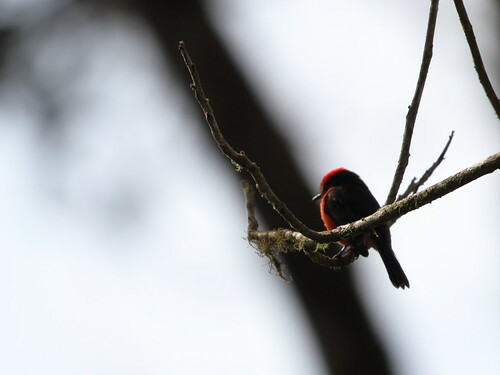 I was using my 7D + 100-400mm between 80-90% of the time. still, being able to switch from telephoto to wide angle near instantaneously helped me capture a lot of shots I wouldn't have gotten otherwise. 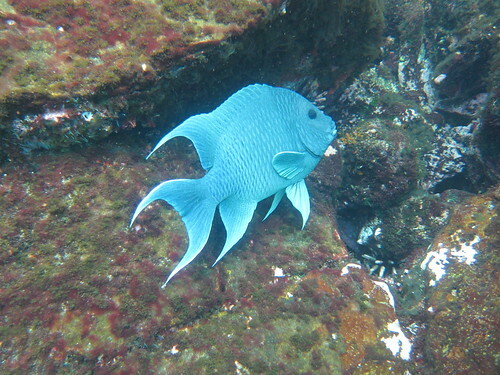 my point and shoot and underwater housing were useful, though other passengers were getting better results with smaller cheaper underwater cameras. The bulk of my camera accessories (filters, mini tripod, 1.4x extender) were all unused. Speed and not having to fiddle with things are so important when you have limited time on the islands, and when you're traveling with a group and need to keep up. ... So many great memories. I'd recommend this trip in a second. Already thinking about where I want to go next. 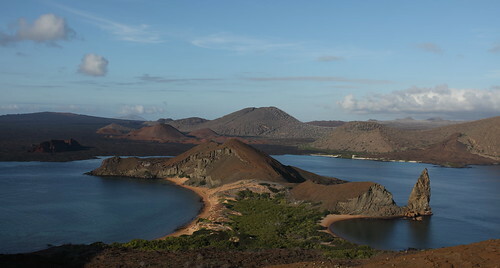 Genovesa was the bird island. 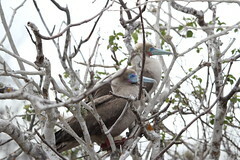 The steps led up a cliff wall; at the top was a bunch of leafless trees (dry season) where red-footed boobies nested. 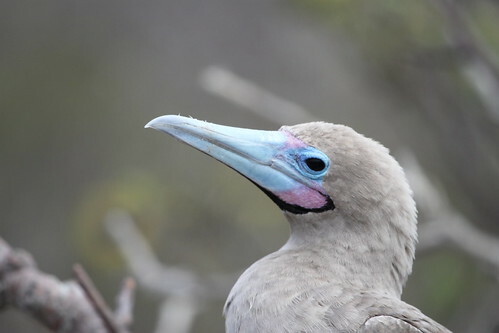 Red-footed boobies can, despite their webbed feet, grasp tree branches. 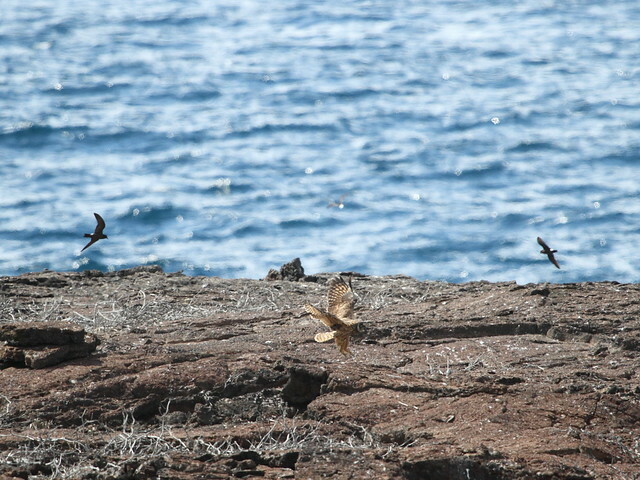 The branches give them cover against other birds (frigates and hawks iirc). 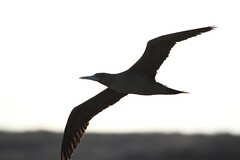 I definitely got my practice in photographing birds in flight this day. We spent a lot of time looking for owls, and finally spotted one, far in the distance. 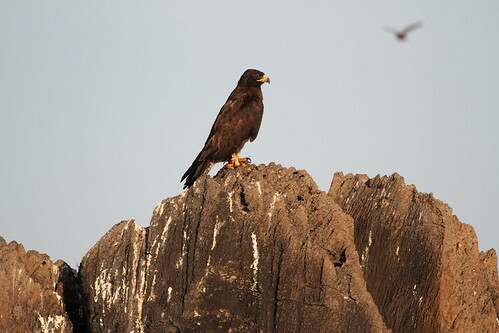 I managed to get a number of shots at the far end of my 100-400mm, which was the highlight of the morning. 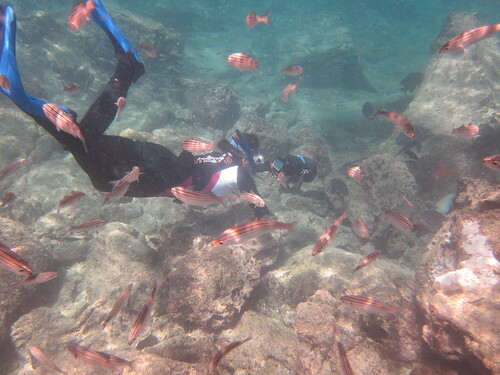 The snorkeling was decent. Our group managed to find Helen's sunglasses that she dropped in the water on the way down from Prince Philip's steps. 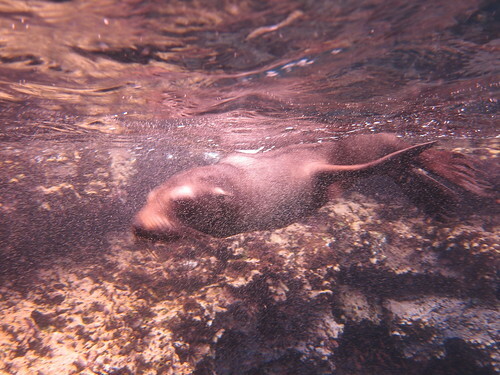 I think my underwater point-and-shoot skills were the best of the trip, though. Part of it was getting rid of the orange filter; the rest was knowing the settings that worked for me and knowing to get close. Practice makes perfect, I think. Afterwards we had our departure briefing, which was sad. 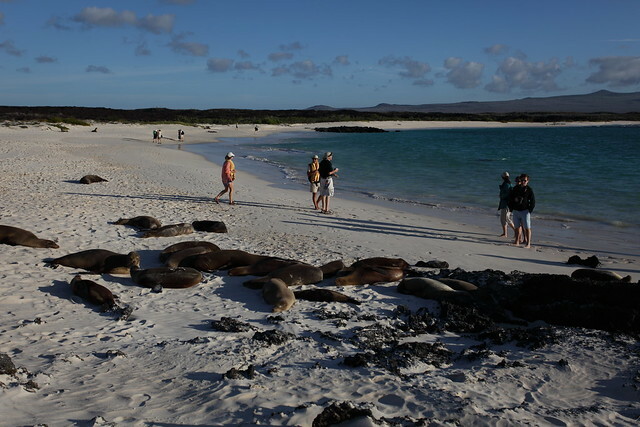 I left a tip for the crew+naturalists and donated to the Galápagos Lindblad fund. 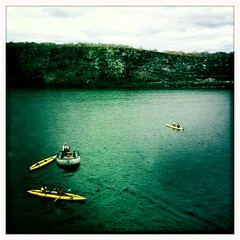 There was a bit of a tradition -- the passengers against the crew, in a kayak race around a zodiac and back. Cindy insisted the night before that the crew never win, but despite our best efforts, the crew came away with first prize. However, there were prizes for the first crew team and the first passenger team, and lots of amusement all around. 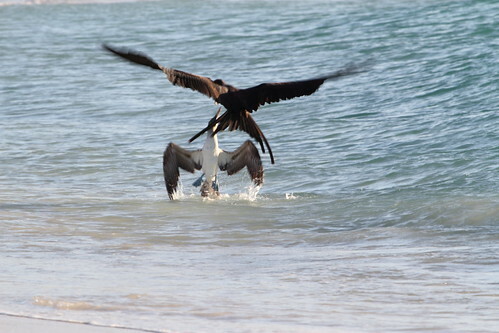 Finally, we had a wet landing on the beach, the one wet landing where you needed shoes at all, really. 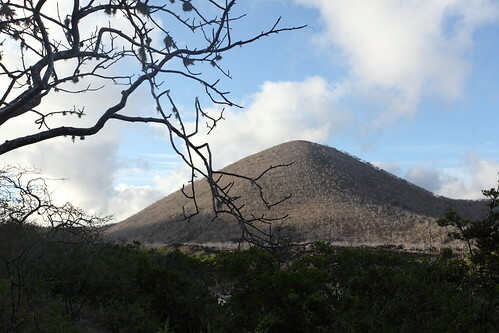 I wasn't looking forward to it since I had rubbed my feet raw in my flip-flops the very first day at Cerro Brujo, but I changed into my hiking boots on the beach and all was good. 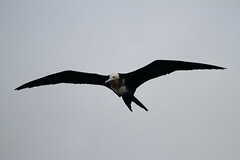 Birds were nesting all around and flying overhead; more bird-on-the-wing photography! 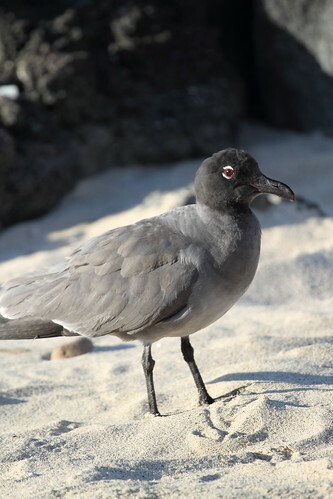 I spent a decent amount of time trying to catch the sunlight behind the white feathers of the swallow-tailed gull. 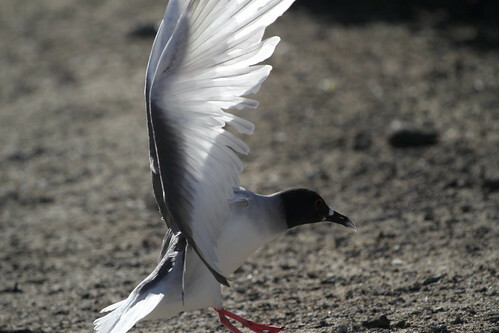 After hiking over the lava rocks to see the view, we saw gulls mating. 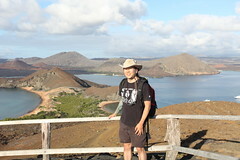 We woke early, again, to hike to the top of Bartolomé Islet, to see and photograph the iconic Galápagos view. 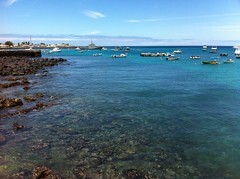 The snorkeling off the beach of Bartolomé might have been the best of the entire trip. 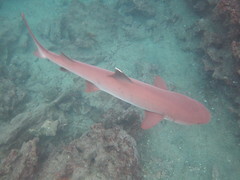 A couple penguins jumped in the water with us, and I saw 3 different white tip reef sharks, one almost close enough to touch. 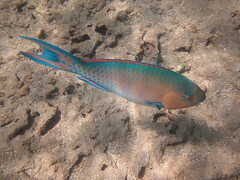 I'm still very much a bad underwater photographer, but had fun doing it. Some of the others are getting some great shots underwater. 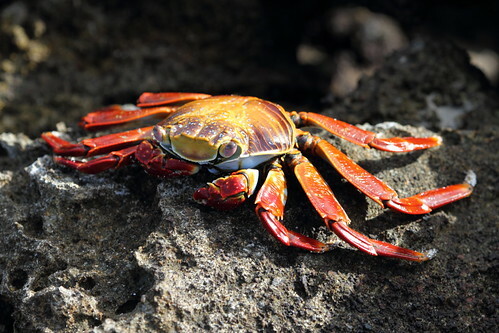 I think I'd throw all mine out if they came out like that on land. 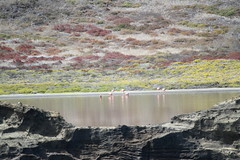 After lunch, on the way to Sombrero Chino, we passed by an island with an old crater, and in passing caught a maybe 30 second glimpse of flamingos in the lagoon inside that crater. I managed to get a few not-too-bad-for-being-very-distant shots. It's kind of awesome how they were able to tell us practically to the minute when that view would appear. 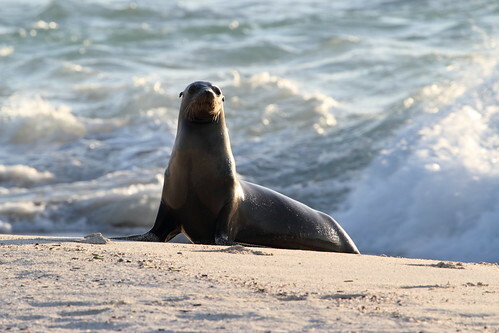 I missed the 2nd round of snorkeling, but caught the zodiac ride near sunset, where we saw sea lions playing near the shore. 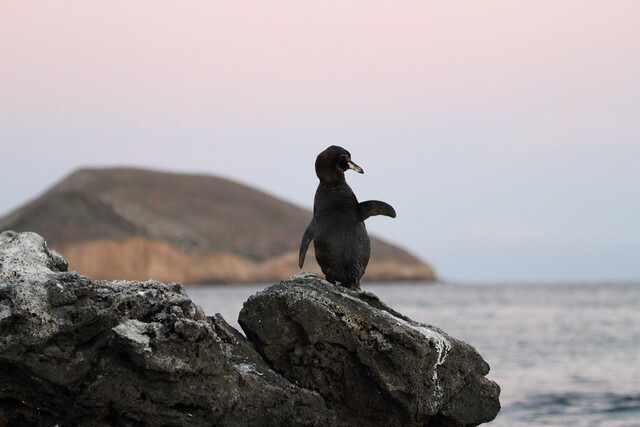 We circled several times, waiting for penguins, but nothing. 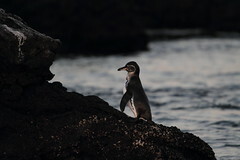 As it grew dark and we prepared to turn around, a penguin swam up to the lava rocks; we converged; it climbed up and we all were taking a ton of pictures. 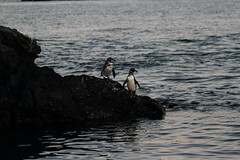 Then, as we watched, a bunch more penguins swam up and congregated on the rocks. Very, very special. I cranked the ISO on these last two, as it got dark, so they look brighter than the earlier ones... Can you tell I don't do a lot of editing? Dinner was an outdoor barbeque where Cindy, our expedition leader, told us we needed to visit South Georgia... Falklands, South Georgia, and the Antarctic peninsula is a full 3 weeks. 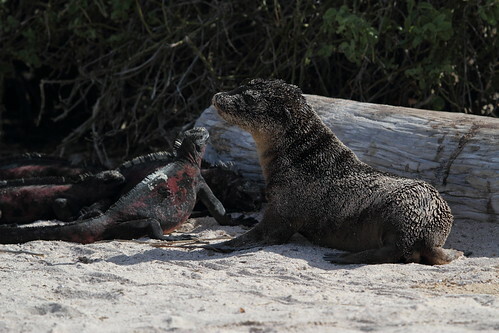 "Galapagos on steroids" is her description of it. A bunch more people were out looking for activity in the water; word spreads fast. Wasn't quite the same; headed inside and made the mistake of checking some work email. 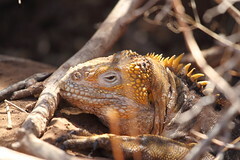 In the morning we went ashore at Cerro Dragon to see land iguanas -- we saw a few, but the highlight was probably both the arid landscape and the flamingos. After lunch Celso gave a presentation on Darwin. 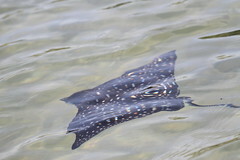 I didn't go kayaking, again, but I did go on a zodiac ride... and got some pictures, notably some distorted pictures of a ray. 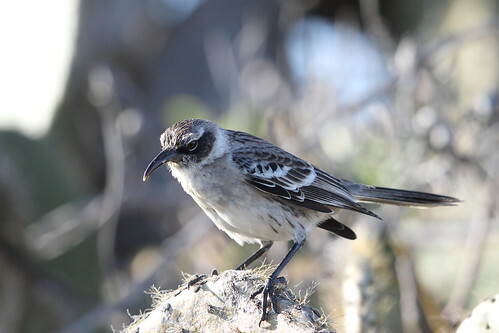 The "What Darwin never saw" documentary was cool -- essentially, the Galápagos are well suited for noticeable evolution because there are multiple islands that have different climates and ecosystems that favor different traits, and there are fairly regular events where a large percentage of populations (finches, in this case) die out, favoring the traits that are best adapted for that island's ecology. Champagne on the bow, though it got dark before we could circumnavigate Daphne Major. 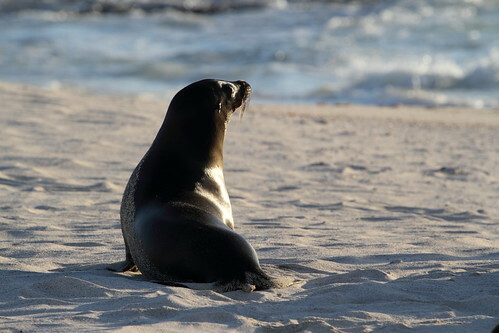 After dinner, however, while I was talking with Betty about which five photos I should submit to the slideshow, Helen called us out to the deck -- there were sea lions and sharks in the water, drawn to the light. We hung out for a long while out there, watching the dark forms of sea lions hunt and the forms of sharks swimming through the water, some turtles too. That was cool. 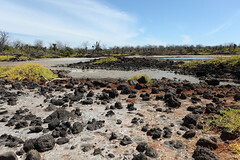 We went ashore at Puerto Ayora, the economic hub of the islands, where we went to the Charles Darwin Research Station to see their tortoise breeding program. So many cute tortoises! 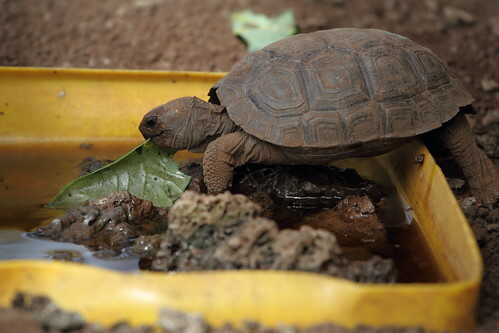 There are tortoise species specific to each island, evolved to match the food supply. 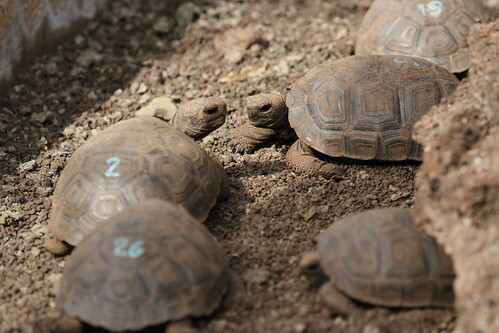 At the CDRS they breed the tortoises and bring them back to each island when they're old enough to survive on their own. 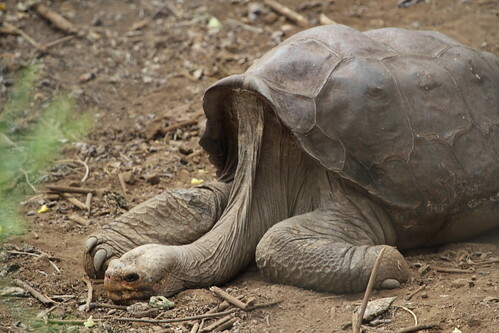 We got to see Lonesome George, who may be the last Pinta tortoise. 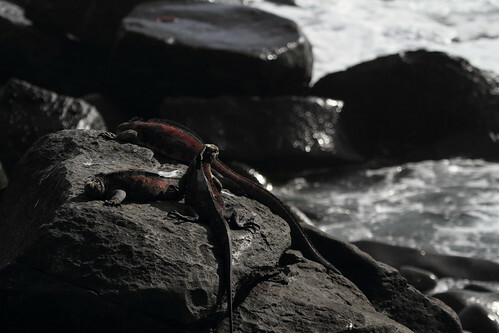 They also had some Galápagos land iguanas. 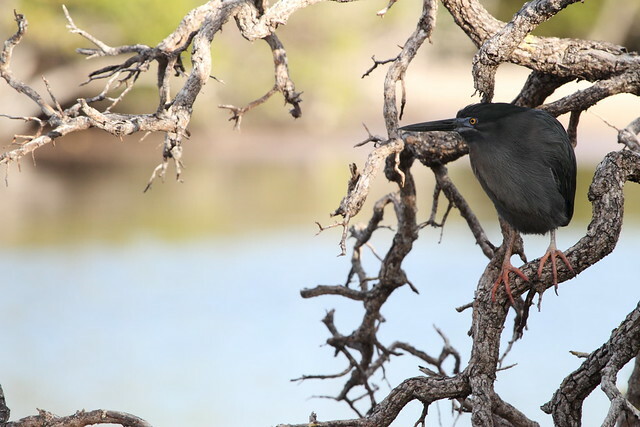 A few of the naturalists were able to visit their families, which was good to see. The walk to town was fun; I picked up some presents for the family. Then we took a bus to the highlands. The sugar cane mill was a nice diversion. I quite enjoyed lunch at a highlands restaurant called Altair. They had an owl nesting in a building in their backyard; when I went to photograph it, everyone handed me their camera to take a picture. That was fun, though I learned I don't have a clue how to navigate around manual mode on a Nikon. The pit craters weren't particularly interesting to me, since I'm not a huge botanist, and the photo opportunities were slim. The walk through the tortoise migratory route was pretty amazing, though, since there were dozens of tortoises, in the wild, along the way. During that walk we also walked into a lava tube. 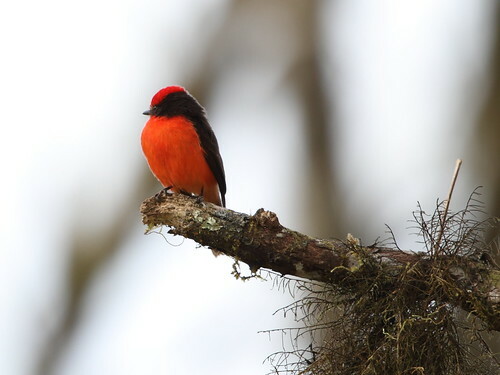 We also spotted a rare vermillion flycatcher. 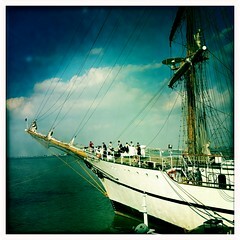 We picked up some high schoolers who had won a school contest, and get to ride with us on the ship. 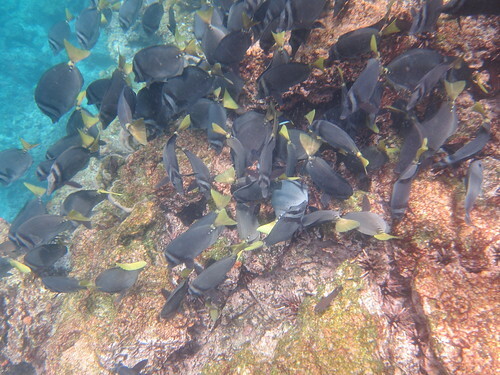 They had never been on a boat and have never snorkeled; I learned second hand that most of the locals aren't allowed into most of the national park areas at all (97% of the islands). I do think that showing them what they're preserving will help local conservation efforts. 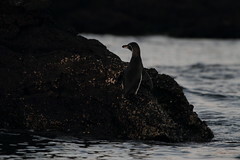 Up at 5:45, 15 minutes before the optional wakeup call for the wet landing at Point Cormorant. This was a sea turtle nesting spot. The nesting mostly happens at night, so we caught sight of a sea turtle in the surf, but none on land. 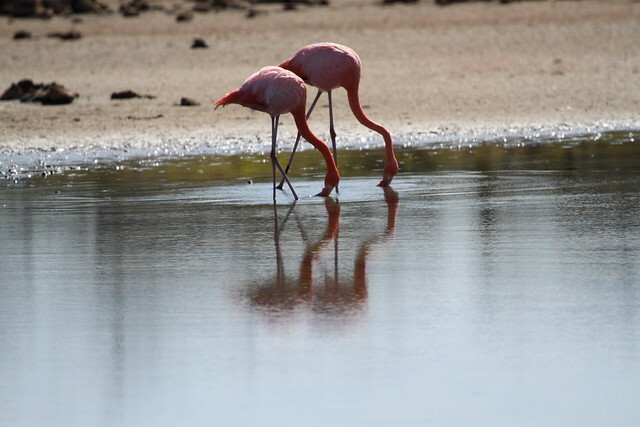 The salt water lagoon was low on water, which meant no shrimp, which meant no flamingos. 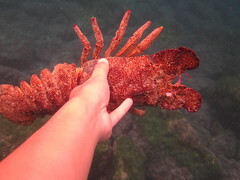 I skipped the quick Zodiac ride around the islands, but went for the deep water snorkeling at Champion Islet. 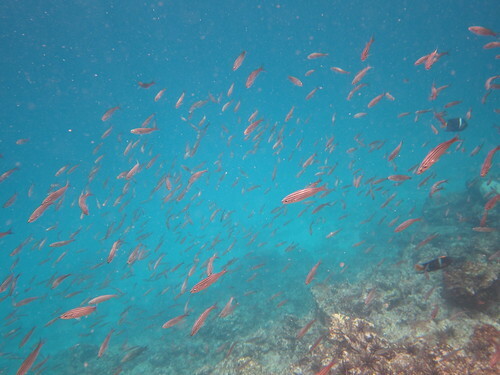 When we jumped overboard, the water was cool, again, but what first struck me was the hundreds and hundreds of fish swimming maybe ten feet below us. 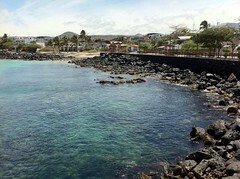 We swam along the rock wall to our right, with the ocean floor going deep below us to the left, and saw many fish, some starfish, and thousands of spiny sea urchins. 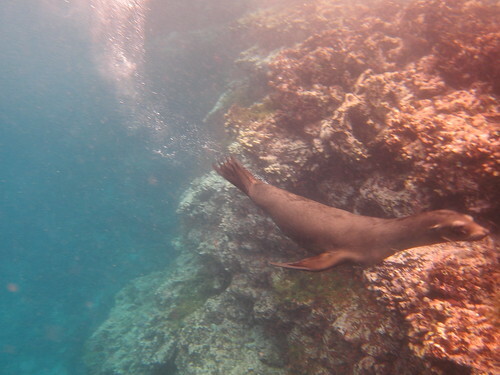 The highlight was probably the diving and somersaulting young sea lion; Celso, our naturalist, somersaulted with it for a little while, which was fun to watch. I wish I had thought of getting video of that. Birgit's post-dinner crittercam presentation was pretty cool. 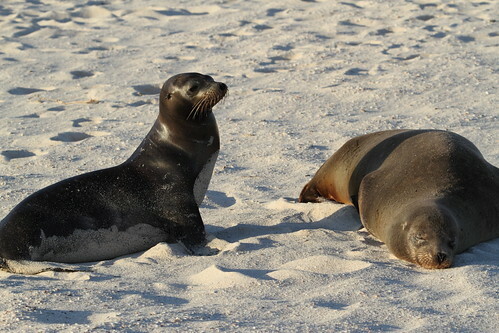 We saw clips of emperor penguins hunting, sharks hunting, seals and sea lions capturing and eating octopi, whales feeding, sea turtles looking for mates, and even a cat catching and eating rats, all from their points of view. 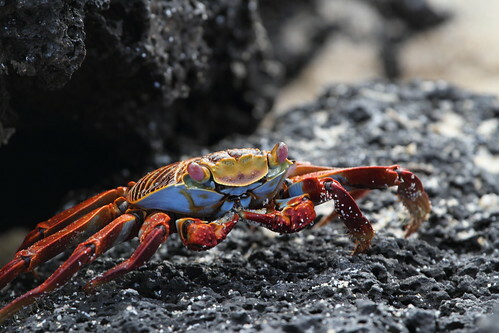 Tomorrow looks amazing, at Santa Cruz -- the Tortoise Rearing Center, the Charles Darwin Research Center, a sugar cane mill, a highlands forest, and some local shops during a full day out all sound wonderful. It's near impossible to drag me out of bed to check email and get to work. Yesterday I woke at 4:30 to fly to the Galápagos, and today I woke at 5:50 to see the dawn across the ocean. I think morning-person-ness is all in the context. Speaking of, in the I'm-a-bit-surprised-but-it-makes-sense-really-department: at the equator, sunrise is a few minutes off of 6am; sunset is a few minutes off of 6pm, and when it sets it sets fast. And it's like that year-round. If you're looking to bask in hours and hours of sunlight, you're better off going toward the poles during the summer. 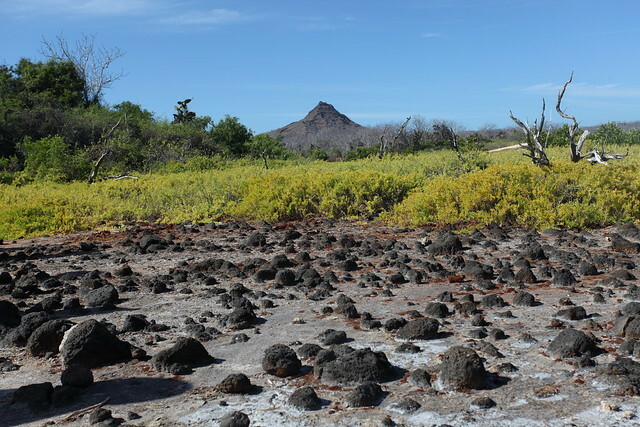 Española is the oldest of the Galápagos islands, which are built from a volcanic hotspot in the northwest and slowly travel southeast via tectonic movement. The southeast currents hammer the island, which is slowly dying; when it's eroded below sea level, it will be gone forever. 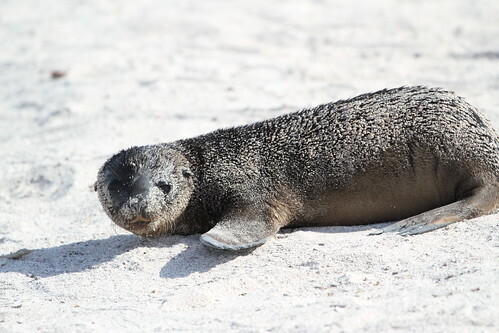 Española is the breeding/nesting ground for albatrosses, blue-footed boobies, and sea lions. But really, it was easy and fine and felt great going in -- water a bit cold but not too bad, especially with the wetsuit. 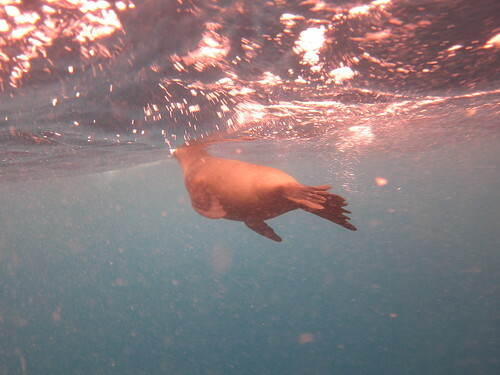 I was predictably awful with my unfamiliar underwater camera. I had some ideas of how to improve it the next time, and considered leaving it behind the next time too. 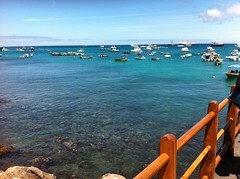 I didn't know it at the time, but the snorkeling would only get better from here. 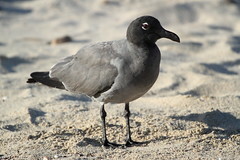 I had a chance to go back to the beach afterwards, but I chose to shower and dress in a bit more of a relaxed fashion. This was a dry landing, and a 1.5-2mi hike over rocky terrain. It wasn't so hard, but a lot of the others had trouble with it or took the short route. 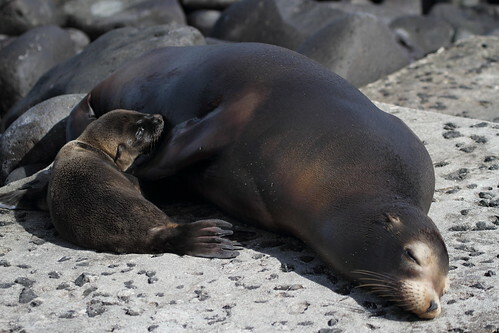 It was sea lion pup season; lots of babies and pregnant mothers. 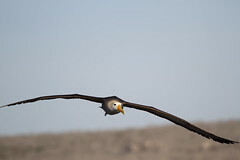 It was also baby albatross season. 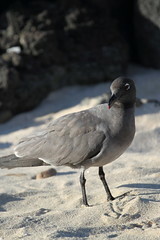 Blue footed boobies, endemic mockingbirds, a Galapagos hawk, crabs, marine iguanas, frigate birds, albatrosses, yellow warblers. 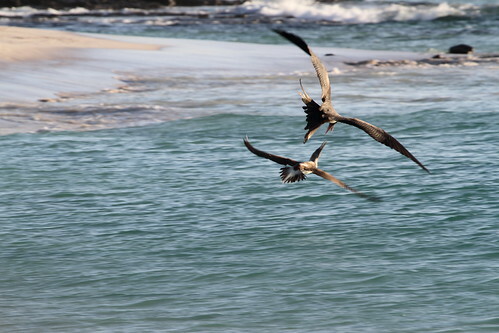 We saw an albatross mating dance. 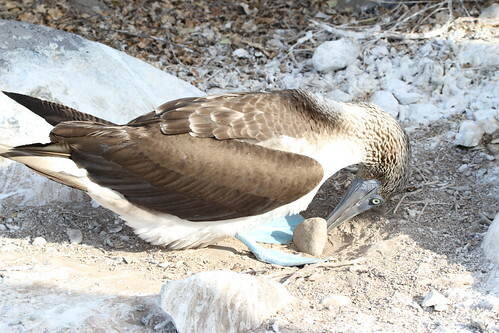 We saw a pair of blue footed boobies nesting a pebble, which they will do if they've found a good nesting site but don't have an egg yet. We saw a blowhole -- a narrow gap between rocks that the surf shot into and up with a burst of spray, maybe 20, 30 feet in the air. 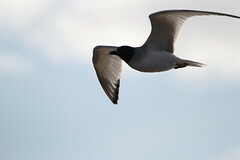 One of the other travelers had a 500mm lens, trying to get shots of birds on the wing, but I think I held my own with my 100-400mm. Sea lions and blue footed boobies were directly on the path a lot of the way. 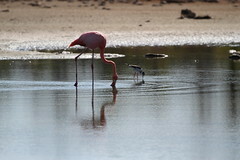 I kind of want to see the wet season now, but the dry season is great for fish and birds. After dinner one of the naturalists, Fernando, talked about how to take better pictures. I knew most of it but it was good for a review, and a lot of people asked me for help. 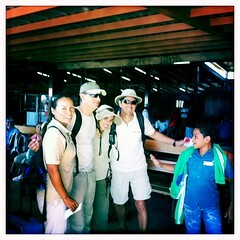 We woke early to eat breakfast then fly to San Cristóbal. The bulk of our party had arrived late the night before, so this was the first time I saw most of them. 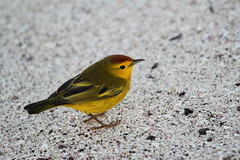 I was predictably antisocial, but some of them were friendly enough to overcome even that. The flight was very quick and very simple. They allowed water bottles on the plane; you didn't have to de-shoe to get through security. They did spray all of our carryons in the overhead compartment shortly before landing, but that was only slightly odd. I did a little early Giftmas shopping at the airport, then we were off to the docks, where the water was a gorgeous clear deep blue. 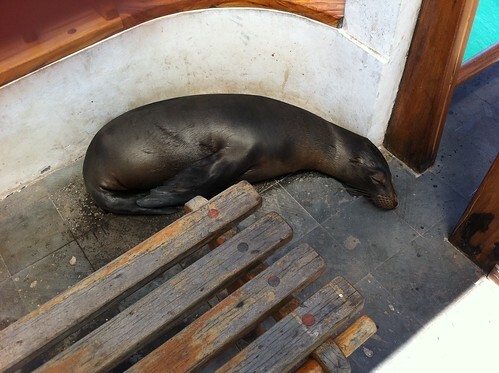 A cute little sea lion was lying on the dock behind a bench, where it honked at people who got too close. We received our first life vest training, as well as our first Zodiac training, and we were zipped off to the Endeavor on a Zodiac. I did picture the back of my backpack popping open and dropping my gear into the ocean, I have to admit. water bottle. I didn't bring mine, but I was thinking of bringing it. They give you one to use. We had a briefing and an alarm drill. I bought some internet time and logged on for a few slow loading minutes. There was a whale sighting but I didn't really get anything even remotely resembling a decent shot. I finished Dexter season 5: good, but season 4 has raised the bar to an impossible level, really. 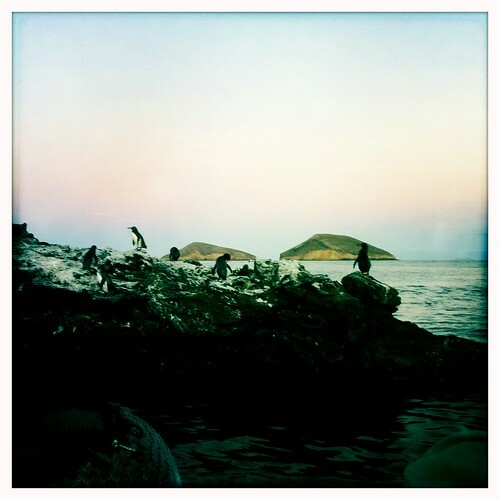 Our first landing: Cerro Brujo. This was a beach, and therefore a water landing. I was carrying a little too much this time, and pared down for the next landing. 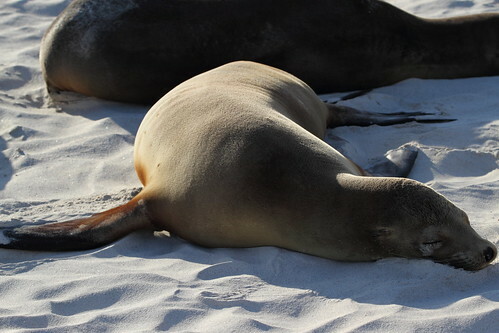 There were sea lions lying on the beach, all over the beach. 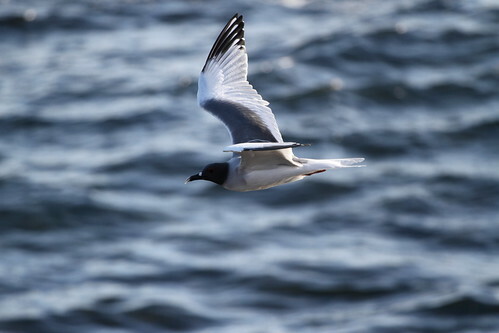 We caught sight of a swallow-tailed gull, with red eyes. 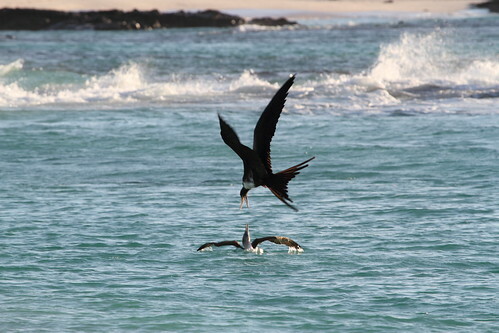 And I saw, photographed, and filmed a frigate bird and a blue-footed boobie fighting over a fish; that was probably the highlight for me. 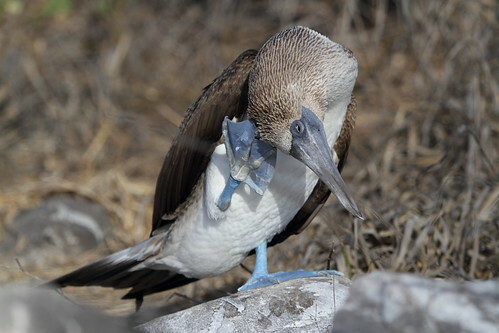 frigate vs blue-footed boobie from Aki Sasaki on Vimeo. The Zodiac ride in was pretty cool too, though I was slightly worrying about my hat flying off and not accidentally dropping my camera. 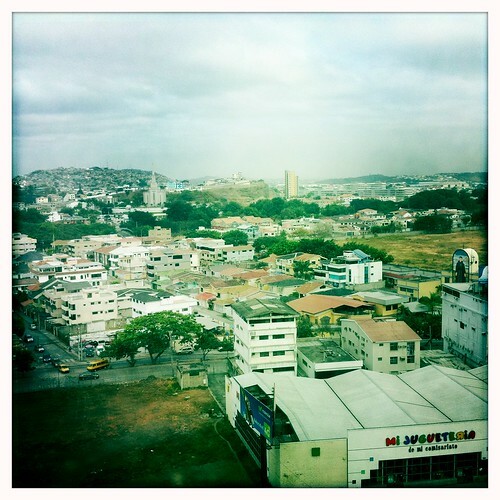 I arrived in Guayaquil, Ecuador, early on Friday morning. 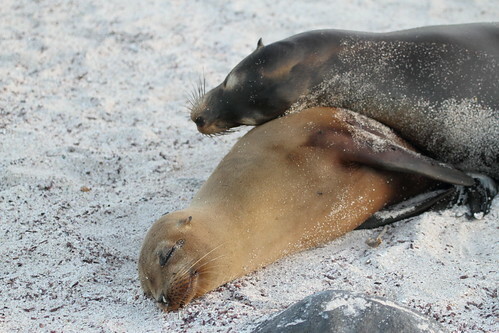 I met a few fellow travelers to the Galápagos, and while they were all above retirement age, most of them were quite friendly. 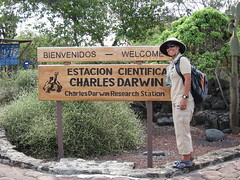 This was my very first time south of the equator. I managed to resist spending the whole day flushing the toilet and watching which way the water drained. My Spanish is awful and practically nonexistent. I napped quite a while; I thought I'd snooze for an hour or two but ended up dozing off from 9am-1pm. I had the opportunity to wander around a foreign city, but I was more interested in washing off travel grime and losing some of the stress and sleep debt accumulated previously. Gym + shower + a late lunch, at an Ecuadorian Japanese restaurant, which I don't particularly recommend trying. Rugby on television was amusing and bemusing; lateral lateral run tackle lateral run tackle lateral run tackle turnover lateral run grab kick, all in about the time it takes to read this sentence. 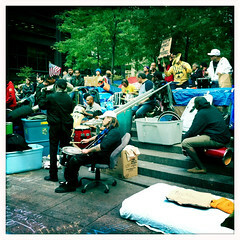 Some Al Jazeera English, then I dozed off again from about 6pm til about 4:30am, an hour fifteen before my wakeup call.